Colin Johnson, Milton Parker, Hartley Greenwell, Jimmy Barnard (capt) Frank Jenkinson, Jack Inman. Thanks to Bob Armstrong for the photo and for providing information and names. "The photo is actually more likely to be from 1947. 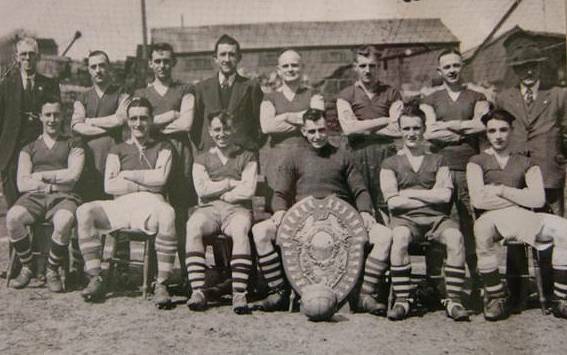 The shield in the photo is the 'Butterfield Shield' , which was awarded to the winners of the now defunct Keighley & District League, which Haworth won at the end of the 1946-47 season."